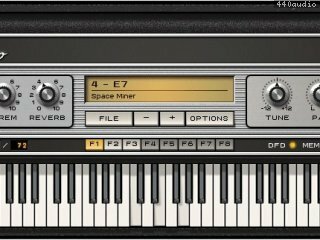 ELEKTRIK PIANO unites the four most beloved E-pianos of all time into one high-performance software instrument, which reproduces in exacting detail the sounds of the Fender Rhodes MK ITM and MK IITM, Hohner Clavinet E7TM, and the Wurlitzer A 200TM. Depending on the instrument, ELEKTRIK PIANO offers various effects for creating instrument-specific effect sounds, including chorus, reverb, phaser, and tremolo. Each instrument also includes a wide selection of ready-to-play presets, which can be grouped into individual performance sets for quick recall of presets during live performance using the computer function keys or a MIDI controller. Altered sound settings can be saved as new presets. ELEKTRIK PIANO 1.5 has a brand new engine under the hood. Based on the super-powerful KONTAKT 2 - Native Instruments' award winning sampler engine, ELEKTRIK PIANO 1.5 now features greater stability, much faster loading times, host automation capacity, an improved voice allocation algorithm, thoroughly reworked 'authentic' patches, and numerous other small improvements from version 1. ELEKTRIK PIANO 1.5 comes with 16 astounding new "Authentic Instruments" presets (four for each piano). All instruments have been carefully redesigned, reproducing the dynamic feel of the original keyboards to the fullest extent. "Authentic Instruments" presets can also be imparted with even greater level of depth and warmth, thanks to the brand new impulse-response room and cabinet simulations. The A200, MK1 and MK2 instruments now include a tremolo effect which can be controlled via MIDI and mod-wheel as well as allowing for automation in your host sequencer. Additionally, instrument presets with different tremolo amount settings can be combined in a single performance. The E7 instruments now include a mod-wheel controllable Wah-Wah effect, a "Sound" knob which will switch through 10 different sound settings and a sustain pedal emulating the E7's characteristic damper mechanism. New options for setting the dynamic range and random values for velocity, volume, and pitch have been added, giving ELEKTRIK PIANO 1.5 an exquisitely 'organic' feel. Also new in version 1.5 is the redesigned voice allocation algorithm which not only reduces CPU usage but also authentically replicates the mechanical workings of a real electric piano.